Auditions on Saturday, March 23rd! 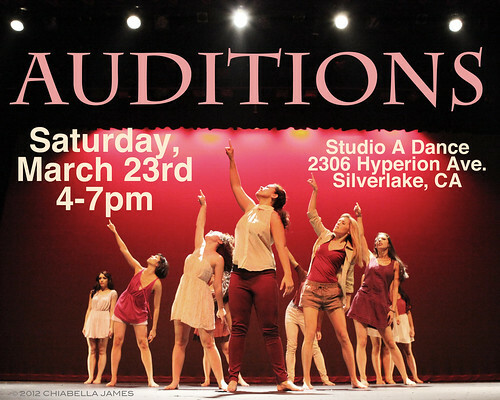 Auditions for our next show will be held on Saturday, March 23rd from 4-7pm at Studio A Dance in Silverlake, CA. Performances will be on Saturday, June 22nd at Studio A’s intimate black box theatre. All styles of dance and all levels of experience are welcome! If this is your first time auditioning for LA Unbound, you can learn about how our auditions work by reading this post. Please arrive at least 15 minutes early to sign in and warm up. If you would like to choreograph for this performance, please email us at launbound@gmail.com by Monday, March 18th.